Fluency in the motivations and methods of the C-suite is an essential skill for PMs on the rise, but it's not a natural one. Succeeding with Senior Management is the first and only book out there to correct this critical skill gap. Project managers are innately task-focused and detail-oriented. In contrast, executives are more focused on overall business goals and often impatient with minutia. That mental divide often leads to miscommunication that alienates executives and sabotages projects. That miscommunication is a deal-breaker when you get to the high visibility projects where you simply can't succeed without engaging the support of senior management. Understanding the environment that senior executives live in often explains their impatience for dwelling on the details, but it is just the beginning of the powerful lessons you'll learn inside. 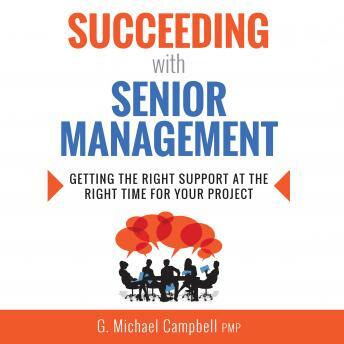 Project managers who master the tools presented in this book can leverage relationships with sponsors and project champions to become real heroes within their organization by moving senior management to action. Master the art of managing up and take your career to new heights.